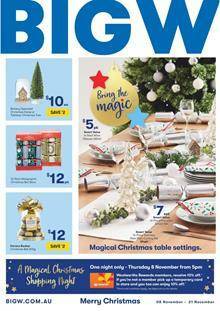 When you want to study Christmas décor and accessories the first part of the latest Big W Christmas Catalogue is a really good source of outstandingly low prices. Early Christmas sales may help you plan your home decoration and party design. Christmas trees are an important element of the whole story. Different styles and colours including white, green, and European style Christmas trees are available on pg 2-3 of this catalogue. The decoration is not limited to the trees. You have two more Big W Catalogues that offer so many options and good prices for this year's Christmas celebration. Gather together with your family and friends, exchange gifts and live happily forever. It's always possible to set up a new understanding of life with the low prices and deals from catalogues like this one. I am not saying money and savings can buy you happiness, but it helps at certain points.